The legend goes that in 2737 BC the Chinese emperor Shen Nong discovered the use of the tea leaves. While resting on a journey a leaf from a wild tea bush fell into his cup with boiled water. He drank from the cup and found it refreshing and healing. In the beginning tea was used as medicine (against head ache, weariness, rheumatism, to improve eyesight and various other things). It took a few centuries before the entire versatility of tea was discovered. Around 400 BC it became a custom to serve tea to guests. The first known book about tea was published in 780 AC by the Chinese Lu Yu called “Cha Ching” (The classical book of tea). He describes the origin, cultivation and the use of tea. For centuries this book became the basic study about Chinese tea. At this time until around the 9th century the plucked tea leaves were pressed into round or brick shaped forms and dried afterwards in the sun (this is still practised today, we offer Pu Erh cakes or black tea bricks, for more info go to www.houseoftea.ie). With this method tea was preserved and also brought into a dense consistency which was important for transport and trade. Tea was so highly valued that tea bricks were also used as payment especially for tax contributions to the Emperor. A change in the way to prepare and drink tea was made during the Sung dynasty (9.-13. century). This period is also called the “Chinese Teaism”. It was characterized by a refinement of the Chinese tea ritual and an improved tea cultivation. Now tea was dried after plucking and pulverized in a mortar. In the Chinese tea ceremony the powder tea was whisked with a bamboo beater until frothy (still used in the Japanese tea ceremony today, Matcha). The Chinese tea culture was booming, tea gardens were planted and tea became a symbol of purity and a way of life. The history of tea and Chinese Zen-Buddhism became inseparable. Zen monks discovered tea as the ideal drink to accompany long sessions of meditation. It satisfied the most urgent hunger feeling and helped concentration. In the monasteries different tea schools developed and the monks started to cultivate tea. The Sung dynasty was overthrown by Mongolian invaders. During the following Ming Dynasty (1368-1644) powder tea and tea ceremony lost their importance. Instead of a complicated ritual a new, quicker method was introduced: the brewing of tea. It is more or less the same way we make our cup of tea today by pouring hot water over the prepared green leaves. At this time tea was drunk by most Chinese people and the brewing technique was generally accepted. Between 1600-1610 (date depending on the source) Dutch ships brought Japanese green powder tea for the first time to Europe. Holland had declared independence from Portugal and displaced it as the ruling trade power in Europe. First the tea was used as medicine and could be bought together with things like sugar, ginger or spices in pharmacies. Due to its expensive price tea was originally consumed only by aristocracy. From Holland tea spread throughout Europe and especially in England had a big impact. 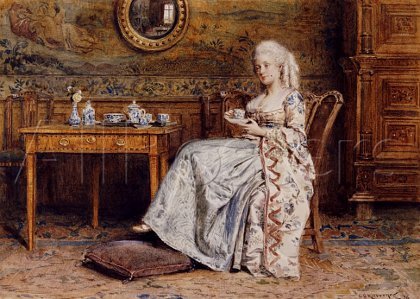 The Portuguese wife of King Charles II, Catharina of Braganza introduced tea as a beverage to the English court when they got married in 1662. Whoever could afford to buy tea tried to copy the royal habits so the demand for tea increased all the time. Soon England opened tea trade with China through the East Indian Company. At the time the Chinese trade rules for tea were very strict. Foreigners were not allowed to enter the country so the entire trade took place in the South Chinese town of Canton. The tea was expensive, limited and controlled by the Chinese. Soon English merchants illegally started to trade opium from the Indian colonies for tea. As a result opium was introduced to China and quickly became very popular. A widespread addiction weakened the Chinese society and the Government started to confiscate and burn opium. The matter escalated and led finally to the Opium war (1839-1842) which ended with a humiliating defeat Chinas. It was forced to open the isolated country as well as five ports for foreign trade (between Shanghai and Canton) and Hong Kong fell under English rule (until it was handed back in 1997). As a result the tea consumption in England increased significantly and everybody was finally able to afford the cup of tea. Things changed dramatically in the 1820s when English officers found a native tea tree in Assam, India (camellia sinensis var. assamica). After decades of clearing the jungle and experimenting in the second half of the 19th century English tea farmers succeeded and exported more and more Indian tea to Europe. It was an important step to break the Chinese tea monopoly and supply more affordable tea to the people. The British Encyclopaedia from 1911 reported “the gradual and almost total displacement of China tea by that grown in the English dependencies” by 1907.